Description: Growing in tufts to 30 cms long, much branched usually simply forked or alternate rarely opposite. Somewhat compressed, but not flat. Habitat: Epilithic in the upper sublittoral. Distribution: Some records from the south and west of Ireland however generally confined to southern coasts of England between Cornwall and Sussex. Europe: Mediterranean, Portugal, Atlantic coast of Spain. Further afield: Senegal, the Cape Verde Isles, Kenya, India, Sri Lanka, Philippines, Singapore, Japan, China, Hawaiian Islands, Florida, Mexico, Caribbean, Cuba and Brazil. 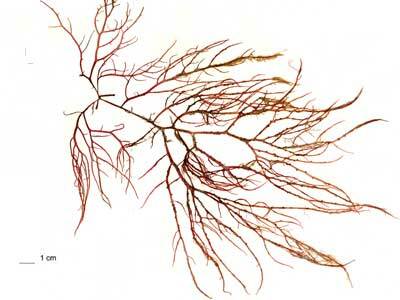 Similar Species: Gracilaria gracilis is said to be "elastic". Dried specimens are difficult to distinguish. Morton, O. & Picton, B.E. (2016). Gracilaria bursa-pastoris (S Gmelin) P Silva. [In] Encyclopedia of Marine Life of Britain and Ireland.